Nutritional support for healthy teeth and bones! 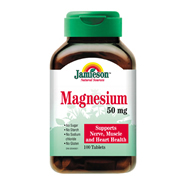 Magnesium aids in the growth and maintenance of bones, aids in the function of nerves and muscles, including the regulation of normal heart rhythm. It also helps maintain steady metabolism and conducts nerve impulses. Jamieson's Magnesium is guaranteed to have fast and effective disintegration. It contains a natural elemental Magnesium. Contains no artificial colours, flavours or preservatives. Guaranteed to be absolutely clinically pure, free from lead and toxic metals. Each tablet contains: Elemental Magnesium 50mg.